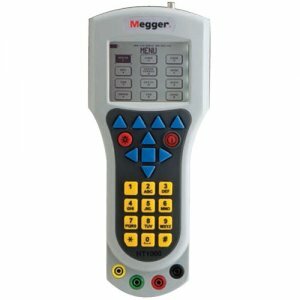 The Megger HT1000/2-A TechMate Copper Wire Analyzer is a high performance, full feature, handheld instrument designed to provide copper wire provisioning and maintenance technicians with the most critical tests at the touch of a button. Durable and water resistant, the Megger HT-1000/2 TechMate is equipped with a highly effective 1/4 VGA LCD screen and a powerful backlight designed to make testing and troubleshooting easier in all work environments. The on-screen menu launches most tests with a single keystroke Super Stress reaches beyond standard longitudinal balance testing, identifying even hard to find short loop unbalances. Dual trace TDR is standard, with 12 trace storage and intermittent fault location. User selectable auto tests with an incremental pair testing process Test for DC and AC volts at the same time, no need to switch between separate screens. download updates and upload test results quickly and easily via the integrated USB port. Easy to navigate and launch testing; many of the standard 26 tests begin with the push of a single button: either from the numeric keypad, or the soft key navigation pad. Direct access to tests: no cumbersome menus. Adds to ease of training new technicians. Voltage, resistance and all standard telecom testing is accessed through the same simple menu layout. Super stress - this test is ten times more sensitive than other technologies available today. What that means is imbalances in twisted pairs can be seen below the 0dB threshold, zeroing in on those imbalances hiding in short-wire loops. Automatic super stress mode - aids technicians in finding invisible faults on short wire loops. All transmission and noise tests for voice band are included along with an open meter which is pinpoint accurate, even in the presence of shunt resistance (dirty open). TDR - the built-in TDR locates shorts, crosses and opens at distances ranging from the end of the test leads to 14.7 km (45,000 ft). It can trace two pairs simultaneously with pair comparison mode to identify potential cable trouble spots. Dual trace TDR allows technician to compare good pair to questionable pair - reads accurately to open or shorted pair. TDR traces can be saved and uploaded to PC for review. Auto test / incremental pair test - user can configure up to 8 series of tests to run automatically. Used in conjunction with the incremental pair test and bulk pair recovery. Built in pair recovery program allows technician to gather data on defective pairs and troubleshoot faults. Store test results - The HT-1000 stores test results data in a comma delimited format which can be uploaded via the integrated USB port to a customer-driven database. download firmware updates - via the integrated USB port. Spectrum analyzer - loss readings up through the VDSL range test protocols. Megger HT1000/2-A TechMate Copper Wire Analyzer RFL uses three or four wire setup and pinpoints fault size and location with simple temperature and cable gage adjustments.